Having a 14 month old who loves to take things and hide them from my husband and I can be rough. I have countless amount of times where we haven’t had our Roku remote for days because it was in a suspicious place like the bath tub or the rag drawer. I remember always thinking, if I could just invent something so I could call the remote and it would ring so I could easily find. I have no time for inventing something like that. So, I did what I do best. I searched the internet to help me find the thing I have always wanted…..and….I FOUND IT!! Now introducing, my most favorite item at this point in my life (No joke.) – The Click N’ Dig item finder! This particular model is an F6. Which means it has 6 different receivers and one transmitter. The transmitter has 6 different colored buttons on it. Each color is meant for a different receiver. That means you pick 6 of your most lost items in your house and you can put a receiver on the item and click the transmitter button and it beeps. You can keep clicking the button until you find your lost item. The beep is loud enough that if the item is one room you can hear it in another room next to it. I am not sure how far away you can be for the transmitter to work. I live in an apartment, so there isn’t much space. But I put a remote with a receiver by my front door, and went to the back bedroom in the corner. My husband told me he was able to hear it beep. When I opened the box it came with an extra set of batteries, for every receiver and the transmitter. That is a company that is totally prepared right there! The other 3 receivers have key rings. You can put those on camera’s, keys, children’s toys,even pets collars, the possibilities are endless! My favorite part about these is that there is no screws to change the batteries. The back just comes off. Which will make my life easier when it comes time to change the batteries. Each receiver also has a tiny light. So if lost in the dark you would see the flashing light, and hear the beeps. A 2 in 1 combo! The receivers are skinny as well. Which makes it seem like nothing is there almost. So they won’t bother you. This is a huge hit in our home. I don’t care anymore if my daughter takes the remotes, she can hide them anywhere and I can find them every time. If you or your kids lose items daily this is a perfect device for you! Click N’ Dig has offered to giveaway one (1) F6 Click N’ Dig item finder!Open to USA and Canada, no Purchase necessary. Contest ends on August 22, 2013 at 11:59 pm EST. This promotion is in no way sponsored, endorsed or administered by, or associated with, Facebook. The winner(s) will be selected by random.org and notified by email and will have 24 hours to respond back to original email with their shipping info or a new winner is selected. Good Luck! Remote controls for sure !!! Super annoying…. My husband is always losing his keys! Keys are lost the most at my house. Cell phones next (but we can just call them) and the wallets. Now you just have to make sure you don’t loose the transmitter! my daughters ipod or my husbands wallet. I wish I’d bought one of these six weeks ago…when I first lost my keys. Because I still haven’t found them! My keys, my phone, etc. Too bad they don’t have one for my brain, lol. I would have to say it’s the remote. This is a pretty cool item. I didn’t know such a thing existed. We lose our remotes ALL THE TIME! We have several. One for the stereo, one for the TV and one for the Blu Ray. So annoying when you can’t find one (or many) of them! This looks like a great product that I would love to have! I am always losing my keys! My keys are always missing and the remote controls. #1 lost item is the remote! My glasses followed by my purse and keys! My teenage son’s keys get misplaced ALL the time! My keys-I am always misplacing them! 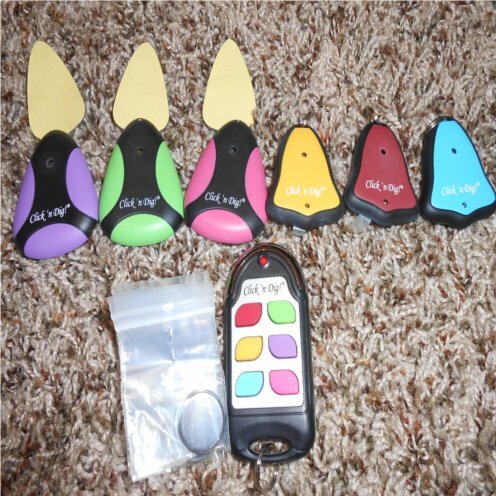 I am forever losing my cell phone when it’s on vibrate and my daughter is always losing our remote to the TV and my keys, this is an awesome invention! My littlest likes to “talk” on my phone. He also just drops it wherever he is when he’s done playing with it. The other day we found it in the trash can. He’s also fond of my keys, which I’ve started keeping on a retractable leash attached to my purse to prevent such disasters. the remote controls. we have 3 for the living room and somebody is always losing them. I’m always losing my stuff (or should i say my kids are always losing my stuff… lol), but probably mostly my keys. Though I have a flip cam that has been missing for a year now. I wish I had had one of these then! lol! I might have been able to find it! My number 1 lost item is my wallet! I’m always just setting it down wherever, then having to hunt for it when I need it! What a pain! I am sure it is the remotes and for my kids their shoes. It would be the wii controllers, I would put this on them! I am always losing my cell phone!! The cable box remote disappears nearly everyday. It drives me mad. 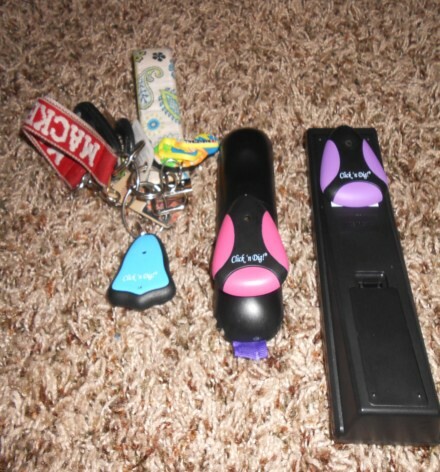 Two items in my house get lost the most and that would be the remote and the car keys! This would be perfect for me…perfect! My husband is always losing his keys. My keys all the time. My keys lol. my hubby is always losing them! I always loose the remote to our tv…..always. i wish i could say it is me, but i always turn up where i last left myself! lol in all actually, my daughter’s keys get lost at least twice a week. would be a great “find” for her. Omg! I would love this! Thanks for the chance! My kids are both constantly losing their phones or ipods. An ingenious idea! I FALL ASLEEP WITH REMOTES ON THE COUCH OR IN THE BED & LOSE THEM ALL THE TIME. IN THE CUSHIONS IN THE LAUNDRY( FLIPPING THE BLANKETS ) BEHIND THE BEDROOM FURNITURE. YOU NAME IT. THANKS FOR THE GIVEAWAY. for me it’s my cell phone….in the house…my kids are always running off with the tv remotes. I always lose my car keys. The remotes are always lost. Just today in fact. We are always losing our remote for the cable box! i have 6 children from ages 18 to 6 months.i also have a grandbaby. so if you name it i have lost it…and could so put these into good use. The remote control is lost all the time. My cell phone–I always forget where I have left it and sometimes there is no one home to call it. It’s a tie between my mind, my t.v remote, my wallet, my phone and my keys. With 3 kids in my house 2 of them under 2 everything get’s lost. I lose my keys all the time,have even put a giant bright colored string on them and still lose them. oh, I guess my glasses. The Apple TV remote since it’s soo small, keys too of course but that’s the biggest culprit! OH My! I can not tell you how many things I have lost or how many times I’ve lost important things. I lost one of our van keys with the remote entry over a year ago Still have no inklin of where it could be. Drives my hubby crazy!!! These are SO what I need Hope I win!! Thank you. The tv remote is ALWAYS disappearing!! My daughter hides the remote! My keys which fall out of my pocket (don’t like carrying a purse) or the remotes that fall off bed and get lost under the bed. OR the cordless phone which the teenager puts down and NEVER on the charger (we don’t get cell phone service @ our house). tHE tv REMOTE. mY HUSBAND IS WORSE THAN ANY KID i EVER SAW ABOUT NOT PUTTING IT UP. You know, I honestly don’t know. We lose remotes, keys, drinks, food, and so much more. I honestly don’t know what the top item is. Probably remotes. It would be the TV remote–for sure—my husband falls asleep with it and drops it and swears he didn’t lose it!LOL But if I won this, I would give it to my daughter in law–she loses her cell phone often. It is generally the remote control that gets misplaced around our house with two grandkids running around all the time. My daughter’s shoes. Don’t think I could put them on her shoes but we sure have a lot of other items that seem to walk away. We have a toddler and 4 ferrets so many items are snatched up and hidden. This would ease the scavenger hunt mode around here. Boy do I need this…between misplacing things on my own…then add in kids and a husband and well we are always in search of things. My husband constantly loses his cell phone, other than that the granddaughter loves to hide the remote control so we can’t change her cartoons. the remote and cell phone chargers always get lost.. Anything I touch! lol The one that I loose the most is the car keys! This is an awesome idea! I would love to win the Click ‘n Dig! Hmm, it is hard to decide what gets lost the most. The house phone? Cell phone, remote, or my house key? They all get lost! We lost a key years ago and never have found it since… We also loose our phones and have to call them to find it. Lol! keys, camera, TV remote in that order. Gosh, my phone and sunglasses… always! Remotes!! All the time! A close second are the PS3 controllers. What timing! We just did the “use one phone to call the lost phone thing”–glad Hubz was home to call it! I lose my glasses all the time. I lose cell phone and keys. The remote is already connected by a string to the shelf behind the couch so it cannot get lost. My fiances keys…I swear he loses them everyday..
Love this I’m always losing my keys!!! The number one item that gets lost around here is the car keys. A close second is the cell phone. We barely use it, so when we are ready to leave the house, we have to go look, find it and see if it has a charge. Car keys from time to time. for sure my cell phone! My wallet and my cellphone. I lose my favorite glasses (thankfully, I have 9 pair) and my keys. Our TV Remotes get lost most often. The most lost thing in my house is the TV remotes they end up every where when my grandkids get a hold of them, And there are 3 to just one of my TV’s….. This would be great! My keys are the #1 thing lost in our house! Cell phone, especially when battery is dead or it is on vibrate or dead. ugh! Always losing the phones in the house. Or trying to figure out whose phone is whose. Can be pretty funny. Thank you for the giveaway. Oh, the remotes….one got stuck in a chair and a half insides…we did not find it till it was moved out of the house and it knocked it out in the moving!! YEARS it was gone! toss up between my keys and my cell phone. but what happens if I lose the transmitter???? I Constantly lose my car keys! I always lose my [email protected]! My brain !!!! lol Prob my keys ! I’d attach these to my Wii remotes and my dog. Let see my key, remote to TV or Sat box and my daughter misplaces her cell because she always turns to silent so these would be awesome! Thanks for the chance to win. we are always missing ipods and more… such a great gadget…. The tv remotes and my camera!! Omg…. those are cute and I so need them or something like it. The number one item that gets lost in our home is scissors. We have probably five pairs and can never find them. In a close second is my cell phone since I keep it on silent and third would be my dog’s harness. Keys are also lost. I would use it for the tv remote! We are ALWAYS looking for the tv remote! I always lose my keys! Remotes, remotes, remotes. We even have two for one of our devices and they both get lost! Keys! We lose keys and cell phones! The T.V. remote at least 5-6 times a day. We have lots of children in our family and it goes missing and there are times we spend hours even days looking for it. I always lose my cell phone. It drives me crazy! And I keep it on vibrate so my kids don’t get woken if it rings at night, so calling it does me no good. I always forget where I put my keys. This sound great! My sanity… But not even the click n dig will find that. However, my keys, wallet and phone are lost QUITE regularly. As much as I love them my boys would lose their heads if they weren’t screwed on tight. Remotes are the worst though…. never can find the remote or the car keys!!! I think it would work great n our house. Like to win. My husband loses everything, right now his lighter is getting lost most often. His glasses was the last month, never found them. Used to be his keys. HAHAHA! I’m ALWAYS looking for car keys! …And cell phones. Our remote is always lost in the couch, somewhere! I think we lose the remote more than anything, but it was a pretty close call. Am always misplacing my cell phone and it drives me crazy! It’s a toss up between the remote and the keys. My keys always get lost! the remotes go missing the most. That would be my keys, I lose them all the time! My keys and sad to say my cell phone!! The baby likes to take the TV remote so we are always losing it….. Either the car key, or my oldest daughters cell phone! my keys! i even have a key holder next to the door and i still cant ever find them! I lose most everything…the remote, keys for my car…key for the post office, the can opener, key to the lock box with important paper…sigh.. Anything that isn’t glued to the wall – I’ve lost it. My number one item i (meaning the kids) lose is the remotes for the t.v. Then keys! Phone…and remotes for sure!! Makes me crazy! I am always losing things. This sure would help me. I love this giveaway, thanks for the opportunity! The volume remote for the sound bar. It’s small!